Real or immovable property in South Dakota consists of land, that which is affixed to land, that which is incidental or appurtenant to land, and that which is immovable by law (43-1-3). A transfer of real property is required to be in writing and signed by the grantor or by his agent authorized in writing. 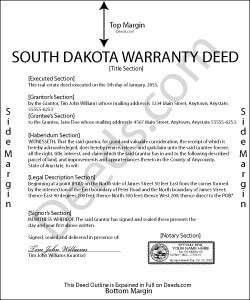 A warranty deed is one such deed that can be used to transfer real property in South Dakota. The statutory form for a warranty deed is presented in 43-25-5 of the South Dakota Codified Laws. A warranty deed implies the following covenants on the part of the grantor: (1) That he is lawfully seized of the premises in fee simple and has good right to convey the same, (2) that the premises are free from all encumbrances, (3) that he warrants to the grantee, his heirs, and assigns the quiet and peaceable possession thereof, and (4) that he will defend the title thereto against all persons who may lawfully claim the same (43-25-6). The execution of a warranty deed must be duly acknowledged to entitle it to be recorded. If the deed is not acknowledged, it must be proved by a subscribing witness (43-25-26). The proof or acknowledgment of a warranty deed can be made at any place within the state before a notary public or justice or clerk of the Supreme Court (18-4-1). Additional officers who are authorized to take the proof or acknowledgment of a deed in South Dakota within their own circuit, county, or municipality are listed in section 18-4-2 of the South Dakota Codified Laws. Warranty deeds can also be acknowledged out of state in accordance with the Uniform Acknowledgments Law, chapter 18-5 of the South Dakota Codified Laws. The acknowledgment or proof of an instrument must be certified by a certificate of acknowledgement endorsed on or attached to the instrument by the officer taking such acknowledgment (18-4-11). A warranty deed must also be accompanied by a completed Certificate of Value when presented for recording. Instruments entitled to be recorded must be recorded by the register of deeds in the county where the property is located. An unrecorded warranty deed will be valid between the parties to it and those who have actual notice thereof (43-28-14). The recording of a duly acknowledged or proved warranty deed will be constructive notice of the execution of such instrument to all purchasers and encumbrancers subsequent to the recording (43-28-15). Every conveyance of real property in this state is void as against a later purchaser or encumbrancer of the same property, or any part thereof, in good faith and for a valuable consideration whose conveyance is first duly recorded (43-28-17). Judith G. said: Thank you, it was easy and fast. The clerks office filed without question. Reply from Staff: Thank you Judith, have a fantastic day! Sandra H. said: I am a retired attorney. I chanced upon this website while looking for a Florida Lady Bird Deed Form. It conforms to Florida Law and was exactly what I needed. The forms are easy to obtain and even easier to use and print out. Reply from Staff: Thank you so much Sandra, we really appreciate your feedback.